Utilizing a microcomputer to control brake force at every moment of the cast, Shimano brings its digital control technology (I-DC4) to a new series of Curado baitcasting reels. Built upon a reel already known for its durability, dependability, and versatility, the new Shimano Curado DC reels will quickly allow all anglers - from the most to avid tournament angler to those who are intimidated by baitcasting reels and the backlashes that can happen - to cast smarter by allowing the DC’s microcomputer to monitor spool speed 1,000 times every second and apply the perfect amount of brake to prevent backlashes and maximize distance. Being introduced at ICAST 2018 and available in August, the DC series includes the Curado DC150 and left-hand retrieve DC151 with 6.2:1 gear ratios, the Curado DC150HG and DC151HG with 7.4:1 gear ratios, and the even higher speed Curado DC150XG and DC151XG with 8.5:1 gear ratios. With the I-DC4 braking technology, anglers can fish a variety of lures and in any weather conditions, with limited-to-no adjustments to the reel. There are four external adjustable brake settings depending on fishing situations. The settings are a ‘max distance mode’ for ultra-long casts in calmer conditions; a ‘braid/mono mode’ for general all-around use of those types of lines; a ‘fluorocarbon mode’ that is best when using these stiffer lines; and a ‘skipping mode’ for challenging casts (under docks and piers) or extreme conditions. 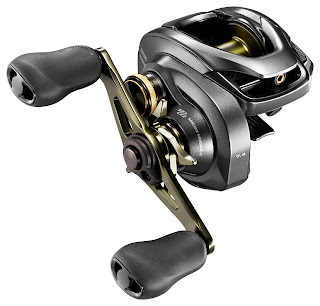 Designed within the Curado series, anglers will notice the overall lightweight feel from the aluminum frame, along with other key Shimano features including MicroModule gears, rigid HAGANE body, CI4+ material sideplates, X-Ship and A-RB anti-rust bearings. For smoother and sensitive rotation, Shimano’s MicroModule gearing provides more gear engagement between the drive gear and pinion gear. The compact HAGANE Body is strong and easy to palm. “Digital control technology is unique to Shimano, and these new Curado DC reels will provide a fishing advantage not seen before in any baitcasting reel,” notes Shimano’s Kurt Mazurek, who has led Shimano’s efforts in introducing the reels to Shimano’s sponsored anglers, pro staff, dealers and fishing media. “During an afternoon fishing out of Grosse Savanne Lodge in Louisiana, Shimano pro angler Bernie Schultz was casting a big frog straight into the teeth of 30 miles per hour winds. We had folks in other boats in the same area, and we all watched in amazement. Most anglers would have made one or two casts - become quickly tired of picking out backlashes and found a calm cove. Not Bernie with the Curado DC. He proceeded to put on a frog-fishing clinic. Never had a backlash. This reel does all we say it does.” All six DC reels will hold from l50 yards of 20-pound test and up to 105 yards of 40-pound test standard PowerPro braid, or up to 120 yards of 10-pound test and up to 90 yards of 14-pound test mono. The DC 150/151 cranks in 26 inches of line per rotation, while the DC150HG/151HG reels in 31-inches per crank. With a slightly longer 48mm handle length (compared to 45mm handles on other models), the DC150XG/151XG blisters in 36 inches of line per crank. All the reels pay homage to their Curado roots with green accents on the handle and spool. They all retail for $249.99 (USD).